These beautiful ladies above are my roommates from college. We were together in some arrangement in the residence halls for almost my whole entire time at UW-Whitewater. We lived together in the suites on campus and even called it The Suite Life (Get it? Like Suite Life of Zach and Cody?). They made my time in college amazing, and it was hard when we started to graduate and “leave” each other. As of right now, half of us live in the same city, and the other half live in another city about an hour and a half away. Now that we’ve all graduated, we decided that we were going to have at least one designated Girls Night each month. First, you need to make a reservation for the night you want to go. 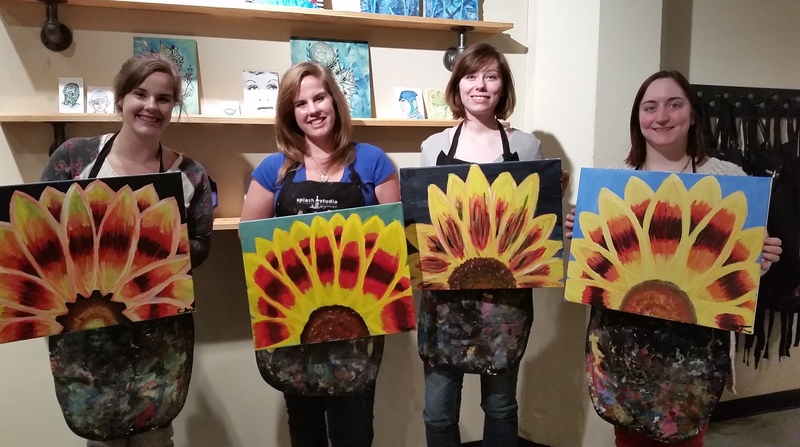 They have an area where you can free paint for $10, and you get a small canvas to paint, but otherwise you need to make a reservation. Here is the calendar for February – they have some great Valentine’s Day nights! When you get there you find your seat, grab a paint palette, and fill it with the paints needed. There’s a chalkboard wall that tells you how many pumps to use of each color. You can order a drink and get settled in for a few minutes before the artists introduces themselves and starts the session. Then it’s time to paint! There were a few times throughout the night that we had a break to let our paint dry. We were able to get more drinks, check out other people’s work, and the artwork around the bar. It really is a neat place with some great artwork, and I would absolutely suggest coming here for a date night, anniversary, girls night, or for no reason at all!